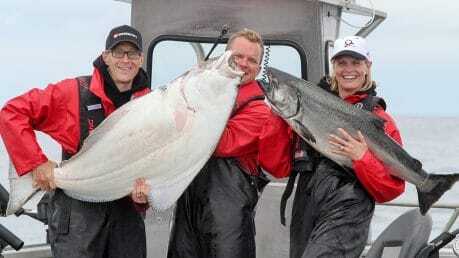 As we roll through the final days of July we’re seeing some big fish popping up in all the usual places. Bird 2, Klashwun Point and Parker Point have turned out some stunning catches this week. 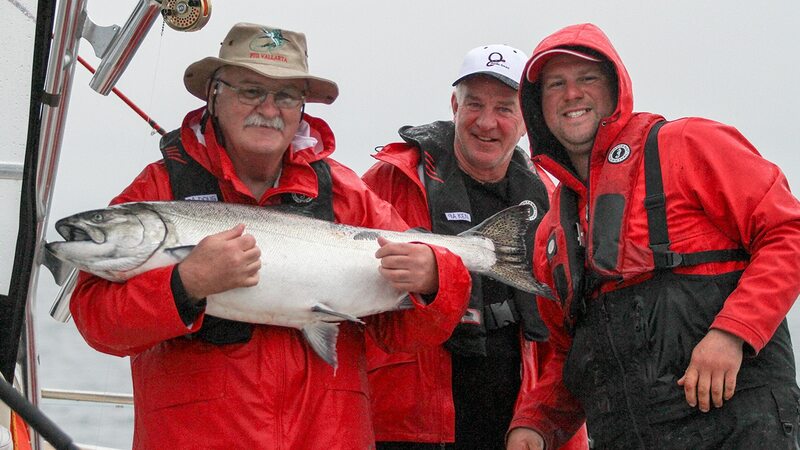 Doug R started off the trip on Friday with a nice 39-pounder while fishing with veteran guide Ran Rainville. Augustin D had quite a battle with a 51 pounder up at Klashwun Point but got it to the boat with some expert boat handling by guide Brian Bowles. And Kendall and Hans had a fantastic first day with the ultimate double – a 34 lb. Tyee and a 62 lb. halibut – while fishing with their guide Ryan Kelly! Guests who choose to stay on the Driftwood may not have all the amenities of the Twin Creeks Spa and the Bell Ringer and Luke’s Limousine service, but they happily trade all that for something pretty special. They get the whole fishing grounds to themselves after all the lodge boats have left the water. There’s something magical about sitting in the glassy calm behind Bird 2; the eagles are harassing the gulls, bears often come down to the beach and the humpbacks love to cruise right alongside the ship, scooping up needlefish along the way. But fishing the point and that tack along the wall inside B2 is some of the most productive water on the coast! 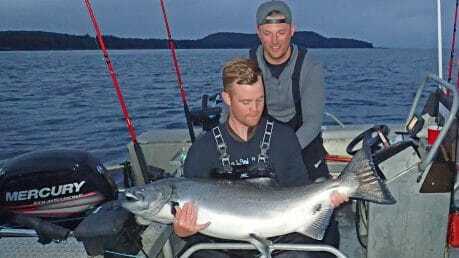 DW guests Brent S and Matt M confirmed that once again as they enjoyed a little after dinner fishing derby on Saturday night. Matt hooked up with a big beauty sometime after 9:00 and played it to the boat with Driftwood guests viewing from the deck. Brent got the whole thing on video and then assisted with the netting, measurement and the release. 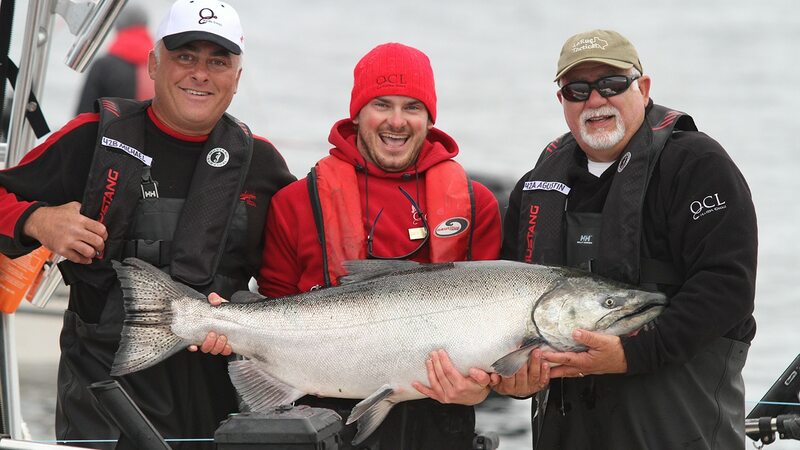 The stunning Tyee Chinook scored out to 57.4 and swam away strongly after some revival time from Matt. Beautiful job guys! Congratulations Matt and welcome to the 50 Pounder Club!